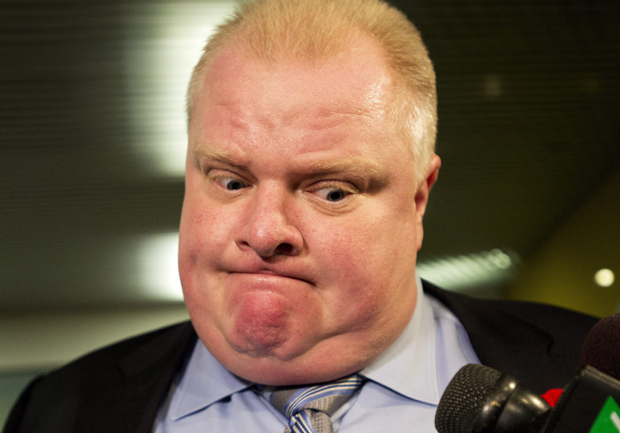 Toronto's embattled mayor says, "I'm not going anywhere"
TORONTO (AP) - A defiant Toronto Mayor Rob Ford declared Monday that he intends to stay in office despite immense pressure to step aside after admitting he smoked crack cocaine. "I'm not going anywhere, guaranteed," Ford told a supporter as he walked back to City Hall after giving a speech during Remembrance Day ceremonies honoring veterans. Later, Ford told reporters, "Let's get it on," in response to a question about a motion filed by a City Council member, Denzil Minnan-Wong, who wants the mayor to step aside. A vote on the motion is likely Wednesday. Ford's refusal to resign or take a leave of absence has frustrated both his opponents and allies on Toronto's City Council, which has no legal way to force him out unless he's convicted of a crime. The unprecedented motion would ask the province of Ontario to pass legislation to remove the mayor if he doesn't agree to take a leave of absence. Some councilors have said they are unwilling to take that step. The provincial government has also expressed reluctance to interfere in Toronto's municipal affairs. "I think it's critically important that council speaks as one voice to say that what he has done is wrong," Minnan-Wong said. "He should go and take a leave of absence, remove himself from council while he gets the help that he needs, and let the city move forward and not be distracted by any of the future information that's going to come out." The mayor of Canada's largest city acknowledged last week that he smoked crack while in a "drunken stupor" about a year ago. The stunning confession came a week after police said they had a video that appears to show the mayor smoking crack. News reports of the crack video's existence first surfaced in May, but it has not been released publicly. Police said they obtained the video in the course of a drug investigation into Ford's friend and occasional driver, Alexander Lisi. The mayor has called on police to release the tape, but police said they are prohibited from doing so because it is evidence in a court case. Police said the video will come out when Lisi goes to trial on drug and extortion charges. Lisi is accused of threatening two gang members who had been trying to sell the video to the media. A judge could make a decision this week on whether to allow the release of remaining portions of a document that revealed Ford's ties and covert meetings with Lisi. Toronto Police Chief Bill Blair has also said police have a second tape, but he has declined to discuss its contents. There's been no indication that Ford will enter rehab since his lawyer said Friday that he was "considering" it. Voters may have the final word on Ford's future. He has said he still plans to run in the October 2014 mayoral election. World War II veteran Tony Smith said after the Remembrance Day ceremony that Ford should not have been at the observances, given his admission last week. Smith refused to shake the mayor's hand.